When you trusted Christ as your Savior, all of your sins were forgiven. Every sin you have ever committed was paid for by Christ's death on the cross. The Bible says, "…your sins are forgiven you for His name's sake" (I John 2:12). This is wonderful, but you must remember that you have a terrible enemy, Satan. You have taken a step that has made him very angry. You have left him and joined those who belong to the Lord Jesus. Anyone who tries to live for Christ will soon be attacked by Satan. Satan cannot take you out of God's family, but he will do all he can to discourage you. He will try to make you doubt your salvation. He will tell you that you will never be able to overcome temptation. He will try to get you to doubt God's love for you. But God has begun a good work in you, and you can be sure that He will continue that good work. The Bible says, "…He which has begun a good work in you will perform it until the day of Jesus Christ" (Philippians 1:6). In this lesson we are going to tell you four things God wants you to know. We will give you verses for each one. We want to show you how you can use these verses to answer Satan's temptations. Be sure to memorize each verse. "You don't really think you are saved just by believing on Jesus, do you? That's too easy. Besides you are still the same person you were before. And how can anybody know for sure that he is saved?" When Satan puts these thoughts into your mind, what will your answer be? You cannot say, "I know that I am saved because I have such a good feeling." You may not have a good feeling tomorrow. The way we know that we are saved is by the Word of God and not by our feelings. Our feelings change every day, but God's Word is always the same. What does God say in His Word? He says that if you have Christ as your Savior, you have everlasting life. 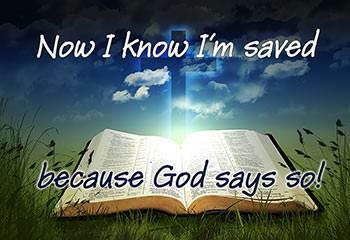 You can say, "I know that I am saved because God says so in His Word!" The Lord Jesus not only saves us, but He also keeps us. He calls us His "sheep" and He says that we will never perish. Jesus said, "My sheep hear My voice, and I know them, and they follow Me: and I give unto them eternal life; and they shall never perish…" (John 10:27, 28). The word "perish" means to be lost. Jesus says that we will never be lost. 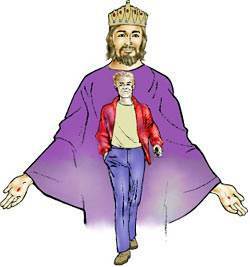 Jesus tells us that we are in the hands of His Father. No one can ever take us out of the mighty hands of God. Jesus said, "My Father… is greater than all; and no man is able to pluck them out of My Father's hand" (John 10:29). "All right, so you're a child of God, but you are a defeated Christian and you always will be. You have certain sins in your life which you will never be able to overcome. You have failed before and you will keep on failing." "There has no temptation taken you but such as is common to man…"
This means that other people are tempted with the same things that tempt you. This means that God always does what He says He will do. You can count on the fact that God is faithful. "Who will not suffer [allow] you to be tempted above that you are able." God promises that He will not let you be tempted beyond what you can bear. "But will with the temptation also make a way of escape, that you may be able to bear it." This means that God will always make a way to escape for you so that you do not have to sin. Be sure to memorize this verse. It is a long verse and it may take you awhile to learn it perfectly, but work at it until you know it by heart. Then use it in times of temptation. Sometimes Satan tries to make us think that we have sinned because we have been tempted to do some terrible thing. But temptation is not sin. We sin only when we give in to temptation. The Lord Jesus was tempted many times as we are but He never sinned. As long as you are in this world, you will be tempted. But, with God's help, you can overcome temptation. 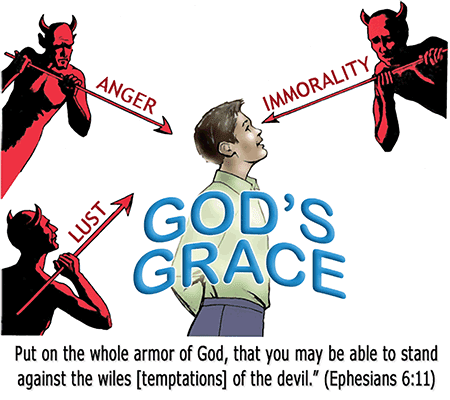 God does not want you to be afraid of Satan and his temptations. The Bible says, "God has not given us the spirit of fear; but of power, and of love, and of a sound mind" (2 Timothy 1:7). God will give you power to overcome temptation so that you do not have to sin. It is true that we do not have to sin. It is also true that we still have a sinful nature, and we often fail. The Bible says, "If we say that we have no sin, we deceive ourselves, and the truth is not in us" (1 John 1:8). "Now you've done it! You are supposed to be a Christian and look what you have done. Christians aren't supposed to do such things. Now God is displeased with you and He will not forgive you." When we think about our sins, we have to admit that they are wrong and that they are displeasing to God. But what does God say in His Word? He says, "If we confess our sins, He is faithful, and just to forgive us our sins." No matter how many times we fail, God promises to forgive us when we confess our sins to Him. God does not like our sins, but He loves us. His love for us never changes. God says in His Word, "I have loved you with an everlasting love…" (Jeremiah 31:3). God loves all people, but He has a special love for His own children. You may wonder how God can love us when we are so weak and sinful. The reason God loves us so much is that we belong to Christ. When God looks at us, He sees us "in Christ." God loves us as He loves His only Son. This is hard for us to believe, but it is true. The Lord Jesus said, "The Father Himself loves you because you have loved Me, and have believed that I came out from God" (John 16:27). Becoming a Christian does not mean that we will not have any more problems. In His Word, the Lord Jesus tells us that we will have many troubles and many problems in this world. "God doesn't really care about you. If He did, He wouldn't let this happen to you." Or he may say something like this, "God is far away and He is concerned with more important things. He is too busy to care about you and your problems." The Bible says that God is our heavenly Father and that He hears and answers the prayers of His children. God loves us and He wants us to come to Him with all our problems. The Bible says, "Casting all your care upon Him; for He cares for you" (1 Peter 5:7). What should we do about our needs? We should pray to the Father in Jesus' name. Jesus taught us that God really is our heavenly Father. We are to come to Him and ask Him for what we need. Jesus said, "…ask, and you shall receive, that your joy may be full" (John 16:24). God does not hear our prayers when we have some sin in our life that we are not willing to give up. But, if we obey Him and do the things that are pleasing to Him, God will give us what we ask for. The Bible says, "Whatsoever we ask, we receive of Him, because we keep His commandments, and do those things that are pleasing in His sight" (1 John 3:22). After thinking about all the wonderful things the Lord has done for you, what does it make you want to do? It makes you want to love the Lord, doesn't it? That is just what the Lord wants you to do! The Lord Jesus who lives in you is a Person. He loves you and He wants you to love Him with all your heart. The Bible says, "We love Him, because He first loved us" (1 John 4:19). To love the Lord Jesus with all your heart means to give Him first place in your life. You bring joy to His heart when you love Him with all your heart and do those things that please Him. 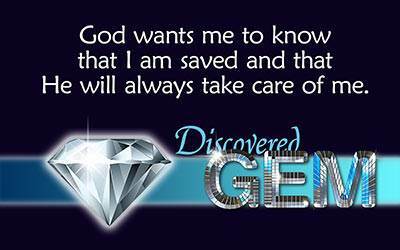 God wants me to know that I am saved and that He will always take care of me. We please God when we love Him. Above all else, God wants us to love Him with all our heart. On one occasion a man asked Jesus what was the greatest of all commandments. Jesus replied, "You shall love the Lord your God with all your heart, and with all your soul, and with all your mind" (Matthew 22:37). We please God when we love His Son. God loves every person, but He has a special love for those who love His Son. Jesus said, "For the Father Himself loves you, because you have loved Me, and have believed that I came out from God" (John 16:27). We please God when we obey Him. The Bible says, "This is the love of God, that we keep His commandments" (1 John 5:3). We please God when we thank Him. The Bible says, "In everything give thanks: for this is the will of God in Christ Jesus concerning you" (1 Thessalonians 5:18). We please God when we let Christ live His life in us. Jesus died for us to put away all our sins. Now He lives in us so we can live in a way that is pleasing to God. The apostle Paul said, "For to me to live is Christ [His life in me], and to die is gain" (Philippians 1:21). Christ lives in every believer. Every believer can say, "Christ lives in me!" Say it to yourself right now, "Christ lives in Me!" "I have been crucified with Christ: nevertheless I live; yet not I, but Christ lives in me: and the life which I now live in the flesh I live by the faith [the faithfulness] of the Son of God, who loved me, and gave Himself for me" (Galatians 2:20). I have a new purpose in life. My purpose now is to please the Lord Jesus Christ. He is God and He lives in me. My goal in life is to please Him in all that I do. Paul's prayer for believers was this: "That you might walk worthy of the Lord unto all pleasing, being fruitful in every good work, and increasing in the knowledge of God" (Colossians 1:10).